After having introduced superyacht design methodology where we tried to explain the main principles upon which superyacht design is based, let us consider a real situation and describe all the steps of a new design, from the initial idea and owner's specifications to the concept design stage. In our case, a 45-metre private yacht, two main approaches are feasible: the first one is a semi-custom production line, i.e. a flexible design, that complies with the requirements of several owners, given just a few fixed standard specifications. The second approach is a full-custom design, meeting the owner's requirements and expectations. The latter is the approach described in this article. We shall imagine an owner requiring precise features: a vessel tailored to his tastes, fit for long ocean passages, offering a life close to the marine environment in every way: the Explorer. Given the initial requirements, we sit around a table to discuss all ideas related to the Explorer vessel: this brainstorming phase is the most important moment for the design. Once the work team is set up and the main concepts are clear, ideas begin flowing freely. Every team member reasons and discusses free from technical constraints, avoiding any consideration, which could stop or simply slow down the early stages of design or, even worst, prevent the adoption of new architectural or engineering solutions. Brainstorming means feeling free to be inspired by various concepts belonging to different disciplines not necessarily related to the naval field. In this way, every component of the work team builds up different futuristic and viable scenarios. The barriers keeping man apart from the environment grow thinner and thinner. Transparency is a term suggesting a myriad of different scenarios: transparency considered as thin skin, as an ethereal barrier between man and environment, as a means to become chameleonic, dynamic, sensitive to the places the vessel will visit. Transparency is considered as the possibility of involving our senses with the voyage, without losing contact with the rest of the world. Online connection with the world means the will to use hi-tech systems for a non-stop connection with the outside, with the land, with our home. Home environment is recreated onboard the vessel; it should ensure the same cosy sensations offered by linings, materials and living areas. If we imagine long Ocean crossings, snug atmosphere means comfortable and it is the sensorial or real means that helps the owner to reach and maintain a psychophysical well-being in every sense. Well-being is achieved through entertainment and hobbies that make life easier and less boring. We imagine toys capable of facilitating access to all the elements let them be air, sea and land. They should bring the owner nearer to the outside environment. On the other hand, he could feel the need for protection, the comfortable sensation of feeling himself protected in every moment and in every place, sheltered from any potential danger. The problem now is how to translate such generic design concepts into a real steel superyacht. First of all we shall analyse what so far has been made with similar purposes, what has been designed and realised with the same mission profile. As the specific requirements of this order do not allow a direct comparison with vessels having similar characteristics (comparative analysis), we shall carry out a typological analysis with different types of vessels sharing at least one characteristic or one feature with our design. The range of our analysis is wide and exciting: it starts from pleasure yachts, then it considers cruise ships and oceanographic vessels, followed by work boats like trawlers and supply vessels, ending with warships. The careful study of different solutions suggested by the above- indicated types of ship opens the possibility of giving a shape to every idea arisen during the brainstorming phase. Nevertheless, each solution has different design requirements: dimensions, shapes, layouts, functions are all influenced and must be taken into account. Of course, the above-indicated specifications do not complete the required technical analysis but they represent the first step towards integrated design. 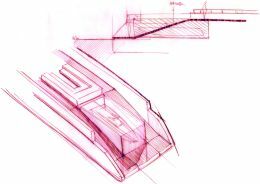 The meaningful contribution of engineering should not curb inventiveness, placing severe limitations, but it should support the most innovative stylistic and layout solutions turning them feasible. This should be done through the search for new techniques and materials, without rigid assumptions or pre-established approaches. The table below summarises the mental flow adopted when looking for solutions complying with design requirements. Let us begin from considering a pleasure superyacht: she represents a clear example of a design customised to the owner's tastes, it is a wandering and floating holiday home, where internal layout favours owner's areas and where much space is devoted to common activities and entertainment. Another example of recreational vessel is the cruise ship, where areas dedicated to fun and amusement, including those dedicated to wellness, are plenty: here psychophysical well-being is the focus of guest entertainment. A debatable aspect is the idea of leaving for a long journey around the world. The owner has a distinct will to break away from stress, chaos and confusion of everyday life yet he is attracted by the world through direct contact with the surrounding natural elements. If, on one hand, the need for privacy recalls the threatening profile of a warship, on the other hand, the desire of exploring the environment is well represented by an oceanographic vessel, whose standard fittings include tenders, bathyscaphes and a helicopter. In this way, our vessel becomes a launching pad for the exploration of sea, land and sky. 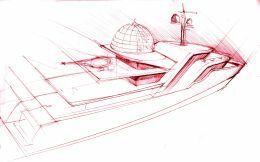 Another decisive aspect, as opposed to the above, is the need of a shelter from the harsh environmental conditions encountered during ocean passages. This feature could be taken from workboats like trawlers and supply vessels, which often have to service in such weather conditions. Here the shape of the Explorer is deformed, masses are moved forward and protected areas aft are opened up. Of course, typological analysis does not exhaust exterior profile definition. It supports the phase where all main aspects of the new design will be grouped together, giving shape to a well- defined structure: the typological analysis supplies single architectural elements for composing our design. Starting from the hull and volumes in general, we imagine a bow high on the water and a forecastle positioned well forward to give the impression of power and of stateliness over the sea. From a functional point of view, a forward forecastle allows the owner to feel at the centre of the vessel. His suite is the core, an irregular prism mounted onto and fitted into the ship's volume which passes through all the strategic areas of the Explorer through different levels, heights, ramps and elevators, thus interrupting the traditional horizontal order of decks. The internal layout is designed to allow the owner to reach directly all areas, leaving plenty of space aft for recreational activities, for fitness and wellness and for garaging of different means of transportation. The aft portion of the hull is intended for different uses: here we find the chameleonic aspect of the Explorer. A wide section below the waterline can be flooded and thus be transformed into a comfortable drydock for tenders (with transom door lifted), into an exclusive swimming pool fitted with air-conditioning system and skylights that may be opened when outside temperature allows it. The mid-section of the vessel is occupied by the engine room (lower deck), the guest cabins (intermediate deck) and open-air terraces (upper deck) sheltered by the forecastle. The crew cabins and dinette are in the lower deck forward. Working areas and the crew quarters are carefully separated from the rest of the living areas with the aim of guaranteeing absolute privacy for the owner and his guests. In order to create such a different internal layout, the traditional structural configuration of the vessel has to be reconsidered. 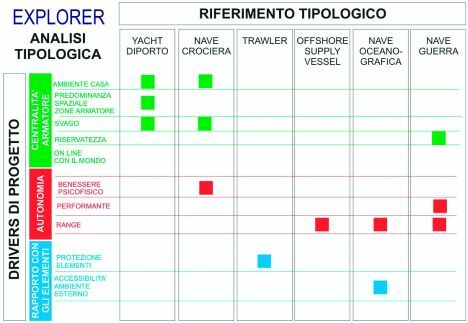 Before introducing the Explorer's solution, let us analyse the most common structural configurations adopted for this type of vessels: "closed shell" and "open side". The first solution (section A) has limited openings on the sides because, together with hull bottom and upper decks, hull sides constitute a closed section strong enough to sustain longitudinal stresses on decks and shear stresses on hull sides. It is also the most convenient solution with respect to stiffness-to-weight ratio. The second solution (section B), typical of cruise ships with external balconies, has a widely perforated side shell, its weakened structural function must be replaced by two recessed longitudinal bulkheads. This implies a weight increase in order to achieve the necessary strength but it offers the designer greater freedom. The Explorer's solution (section C) is a development of the above- mentioned second one: the main structure is recessed inside the hull and a framework along the centreline distributes shear stresses between hull bottom and upper deck. This solution implies a considerable weight increase in order to maintain torsional strength but it offers a high degree of freedom for internal layout. Finally, we are approaching the end of the process that leads us from the initial idea, through different phases, to the final design. Using our imagination combined with our experience we projected the outline of the Explorer vessel, in other words we developed a "concept design". From now on, designers' contribution will follow a well-defined process: preliminary design, detailed design and construction drawings. Through these phases the concept design will be transformed into a real object with the valuable support of all the professionals involved, from the architect, to the naval engineer and to the shipwrights. All of them will make the owner's dream come true.